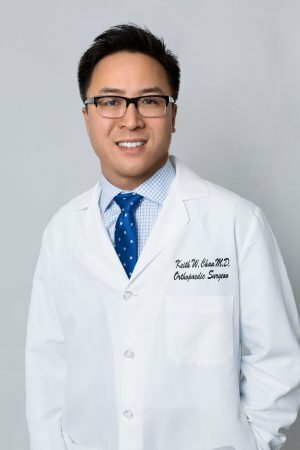 Dr. Keith Chan, a board-certified orthopaedic surgeon, is a San Francisco native and graduated from Stanford University for both undergraduate and medical school. He completed his orthopaedic surgery residency in New York City at NYU Hospital for Joint Diseases and further honed his skills completing a sports medicine and arthroscopy fellowship at Southern California Orthopedic Institute. Dr. Chan is a leading expert on the latest arthroscopic and minimally invasive surgical techniques to help his patients get back to their regular activities. He is well-versed on cutting-edge procedures for shoulder, hip and knee arthroscopy such as superior capsular reconstruction and bridging allograft rotator cuff reconstruction. Dr. Chan also has a special focus on hip arthroscopy and treating patients with femoroacetabular impingement, labral pathology and articular cartilage issues, with the goal of hip preservation and preventing hip arthritis. As well, Dr. Chan does integrate biologic interventions into his practice, utilizing the latest stem cell and PRP technology in treating nonoperative and operative patients. He has served as an Associate Instructor for the Arthroscopy Association of North America (AANA), teaching the latest shoulder and hip arthroscopic techniques to surgeons worldwide and has published numerous scientific articles and academic book chapters.